Together we will build a creation that will come alive with laughter and music! It's BlanketFort RanketFort! The fort with the most fort returns to The Astoria to delight and entertain you. Roll up your sleeves on your PJs and help construct a giant BlanketFort in which our comedy show happens. We need BlanketFort Architects (aka anyone who can work clothes pins) to help or this show cannot happen! Fort building starts at 8pm, everyone invited. Comedy show featuring some real Vancouver gems starts at 8:30. It's all free and it's better with you there. 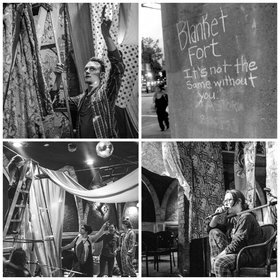 Larissa Blokhuis, BFA will guide you if you are a hesitant fort-maker. With the musical stylings and co-hosted by in the incomprable Paul Fenz. and final, closing fort remarks by the comedic poet lauriet of VanCity, Shlomo McPeake. This event takes place on the unceeded territories of The Coast Salish Peoples.